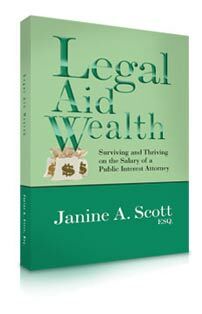 Legal Aid Wealth by Janine A. Scott, Esq. by Janine A. Scott, Esq. Legal Aid Wealth is a step-by-step guide that gives specific advice on how to financially prosper and live well on a modest income. Janine Scott explains how she reached her financial goals and overcame financial obstacles on her public interest attorney salary. Through the Action Plans outlined at the end of each chapter, Legal Aid Wealth shows how to tackle student loans, create a realistic spending plan based on your values and financial goals, save for retirement, buy a house, eliminate credit card debt, and much more. And the book isn’t just for lawyers: Legal Aid Wealth can help anyone thinking about working for the common good on a lower salary successfully manage their money. Copyright © 2011 Legal Aid Wealth by Janine A. Scott, Esq.